Is a log house fire-proof? How long could be used quality wooden building? 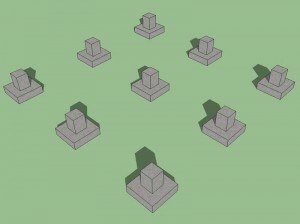 What bases are necessary for log houses? 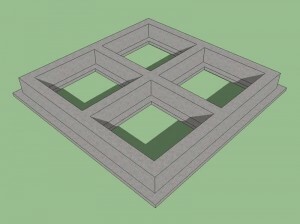 What kind of log house corners (corner connection) to choose? 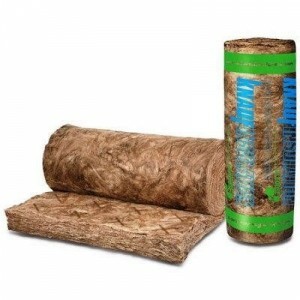 What kind of insulation do you use between the logs? 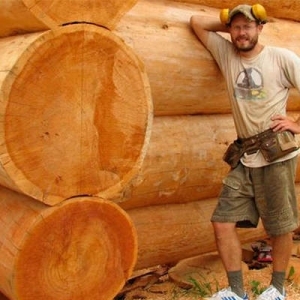 How long will log home settle? 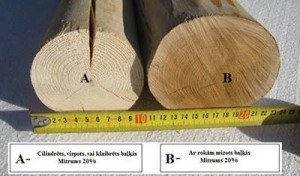 What log diameter is better for baths and residential buildings in Latvia? 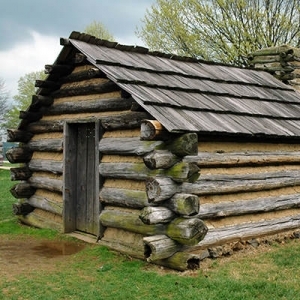 What are the most common log building construction mistakes? What could protect the house from the sun and moisture? How to protect log from damage? All timber is processed using special means, which converts hard wood with combustible and non-combustible materials. 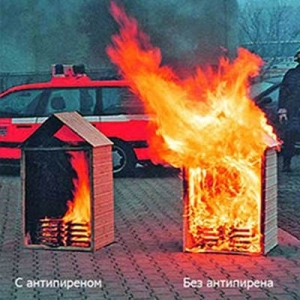 Properly built wooden house is as fire safe as blockhouse. 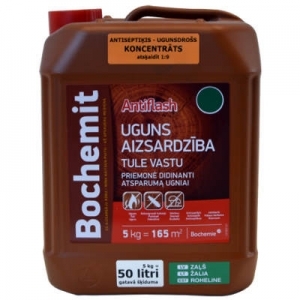 Modern wood protection means, without any harm to the ecological balance, can prevent bacterial effects. Any wooden house can be upgraded to a perfect condition, thus increasing the durability of the structure. 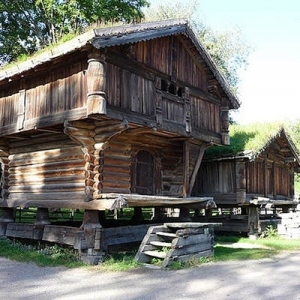 Log houses are one of the oldest type of buildings in the world, they last longer than we can imagine, for instance, at nature museum in Oslo, Norway, one can see a log house built in the 13th century, that is not capped. 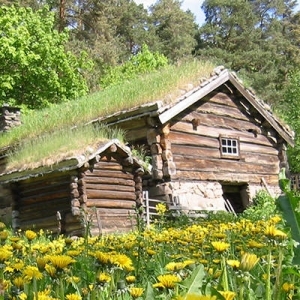 Log house could serve for more than 700 years and even after 700 years it could be still in a relatively good condition. 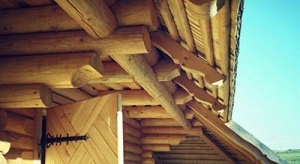 Log house could be based also on the columns, if made according to the requirements but of course preferably to use ribbon-kind of base. Most appropriate are conifers. 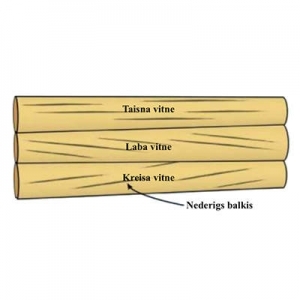 Latvian most often used pine or spruce, but other countries also larch or cedar. We prefer pine because it is slightly stronger than the other kind of trees and less knotty. 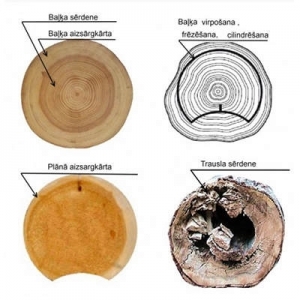 The more wood resin, the longer life of log is, so it is important to cut trees during the winter, in the right month, when the wood is less moisture, and more resin. 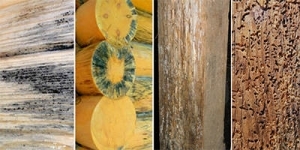 The question of the right choice and processing of logs (for carved log buildings) is really wide. Professionals who are familiar and observe the ancient traditions, are recently met. 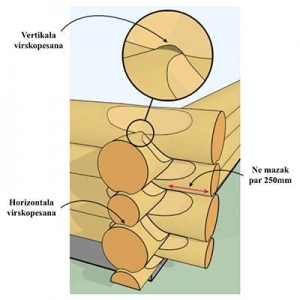 Logs for houses should be chosen carefully, so that the trunk is sawn up to the first green branch and branch number does not exceed one per meter. 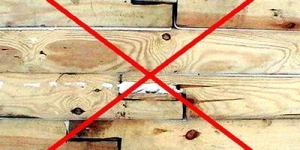 It is not recommended to use logs, which have the fiber thread. 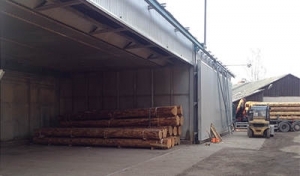 Log’s northern side is firmer, stronger as it grows more slowly, which can be seen in the number of rings, so the north side log should be placed outside the building, but the southern – inside. 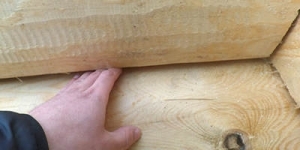 Peeling logs, should prevent the least possible damage to the protective layer of wood, and it is the most appropriate if made by hand (not electric planer). Of course, there are many more fetchings. There are years of experience of professional craftsmens’ and special secrets. Log carcass could be built in a few months time. 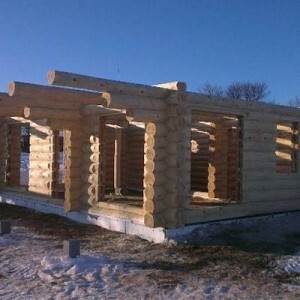 To complete a log house it will take 5-8 months. 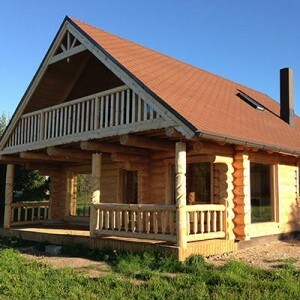 All forms of handmade production had undergone many levels of development and improvement, starting with pimpliest up to the most technically advanced that could save log house from wind and moisture, making it more durable. Let us focus on the hand-carved basis. Could be the easiest way of wood cutting process. 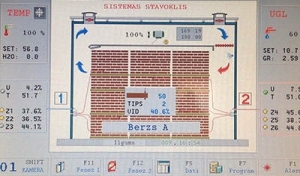 But this simplicity may cause difficulties later because of the wind in corner connections. 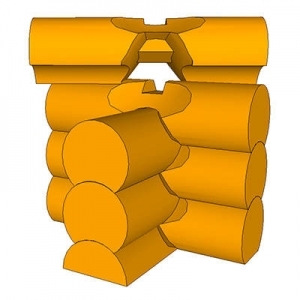 We are trying to use this kind of carving only for garden furniture and any other furniture. Differs from the Russian style in type of form, it has semicircular shape and looks like a trapeze. Canadian style is known for its durability and thermal characteristics which directly depend on the shape of the log cut. 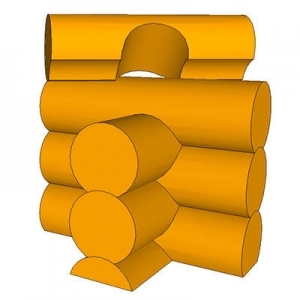 The log is left in a wedge-shaped section of the pin, which is mounted below a stationary beam. With such kind of installation, it ensures tight connection. 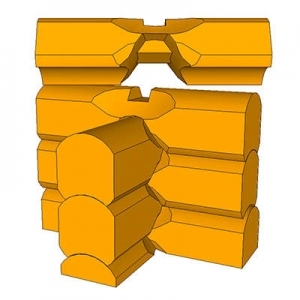 Such shape is not for beauty or simplicity purposes, this is the best solution for log house to settle. It helps to maintain close connection, which guarantees warmth in the house and protects from drafts and moisture. Unlike the Canadian style, Norwegian cutting style implies oval cutting, which is made by a coronation diametrically opposed to the longitudinal direction of the wood. There are no others technological differences. 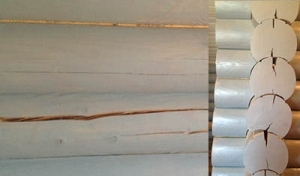 Those customers who likes smooth walls, prefer Norwegian log cutting style. Due to its shape log house offers more space and looks cosy and attractive. 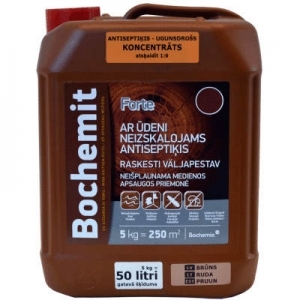 Previously, we used only moss, but after it was banned from collecting in the Latvian forests, we began using ecologically clean mineral wool. 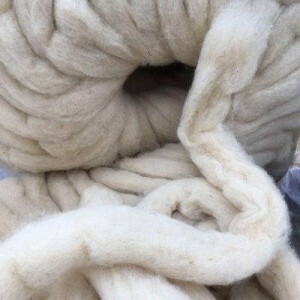 Today, we advise our clients to use a natural sheep wool lining. Normal settling period for log house is 7 years. 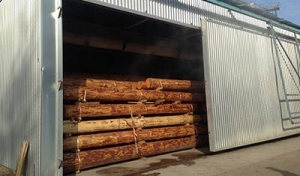 Settling time of the pre-dried logs are up to 2 years. 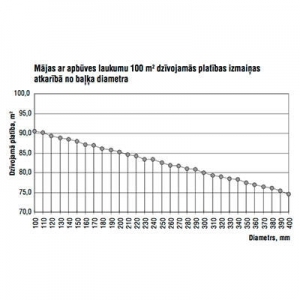 During the drying time log size decreases, it vary slightly, so it could influence furniture or interior elements. 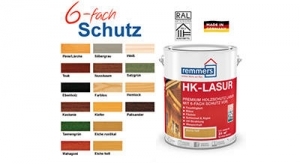 Fully log house can settle down for 7% (7cm to 1 meter). 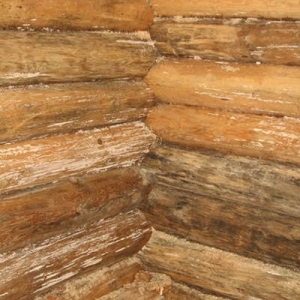 Log walls may respond to atmospheric changes or the beginning of the heating season. Many think that the intense heat of the logs will accelerate drying. This is wrong. House inside logs shall not be drying faster than outside logs that can create gaps between the logs. In the first year indoor temperature should not exceed +20 degrees during the winter. Cottage or campsite, from Ø200 mm. A bath house or holiday homes from Ø250 mm. Residential home no less than Ø300 mm. 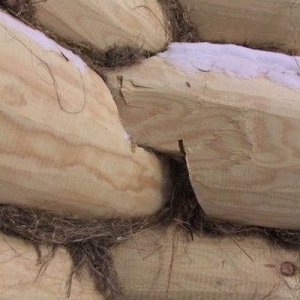 In accordance with building codes for residential buildings exterior wall thickness shall not be less than 300 millimetres, but many people live in wooden houses with half as thick walls and do not complain about the cold winters. For example, in Siberia or Canada’s climate that is considerably colder than Latvian, but 80% of people prefer to live in the log houses. 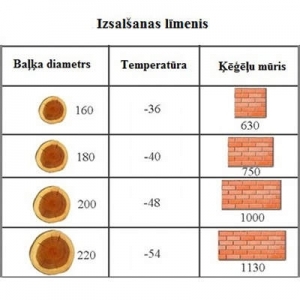 Studies have shown that in -48 degrees wooden wall freezes for 20 cm that is the same as for 100 centimetres thick wall made of brick. Wood is one of the best materials to keep warm, but very important is the quality of construction of the building. There are three most common mistakes. 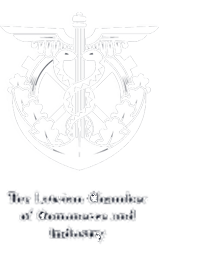 First — not complied with wooden compaction court. Wood while drying shrinks, i.e. reduces the floor height. For example, if the height of the room is three meters, after drying, it settles to 2.8 meters. 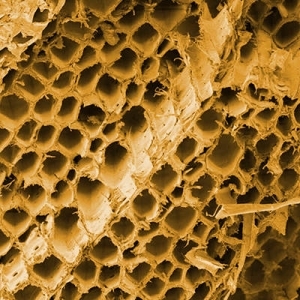 Wood may shrink, as much as 7 percent. The largest settling is if the tree is cut down in summer. The second mistake — inadequate quality of log jointing space. 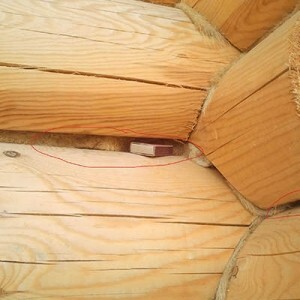 When new log house full of crevices and cracks, and craftsmen are trying to convince the customer that the building will settle and cracks will be removed by themselves but it does not work. 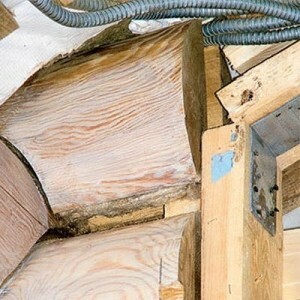 If log connection is loose already it won’t change in the course of settling time, wood drying make slots and cracks increase. 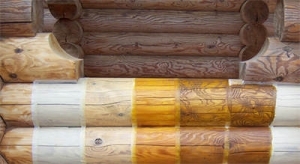 The third mistake — is freshly painted log homes, when raw logs with a moisture content above 50% are painted. Most likely, soon there will appear mold on the walls. If the house is built of wet logs, the first few years it is better not to color it at all, but let dry it up to 25%. 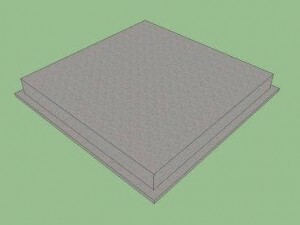 Important house element is a roof overhang. On the sunny side (south, south-west) shall be the biggest overhangs. In summer when sun shines high overhang will protect from heat and during winter’s time it will allow sun shine into the windows. The first rule is not to rush drying processes. On the contrary, if you want to get a good wooden house, understand that the process of its drying shall be quickened. 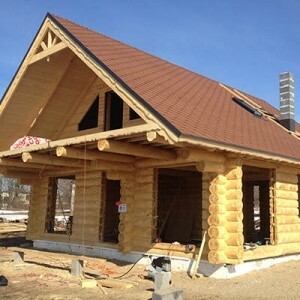 It is necessary to build and start using log house slowly. The second way to deal with cracks or damages is to use modern technologies and work with dried tree. 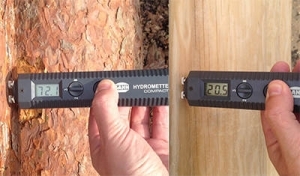 Industrially, even round logs can be dried for up to Ø500 mm with lengths of up to 13 meters. Another rule, which many forget — trees cut at the right time. 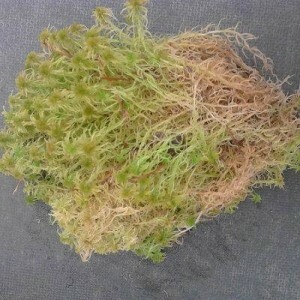 Tree is growing in the summer, has sugar and other nutrients in full, at that time it is particularly vulnerable, very sensitive to blue stains. Preparing for winter, tree accumulates water and nutrients in roots. This is the perfect time to cut the tree. If you haven’t found the answer in the previously provided FAQ You are invited to send us an e-mail or make a call +371 2960 0477.